Why is war a constant in our world? The borders between conflicting nations may shift, and the reasons behind the battles may evolve, but the bloodshed never seems to stop. Yet, one leader chooses not to let the status quo of violence dictate the future of humanity. 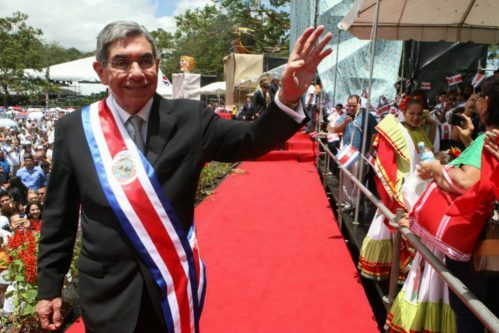 Oscar Arias, the former president of Costa Rica, dedicates his life to the goal of de-weaponizing the world. 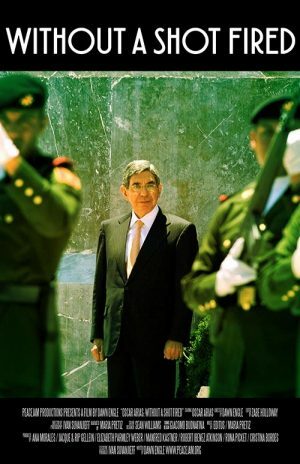 Filmmaker Dawn Engle shares his journey to end the cycle of destructive conflict between the globe’s citizens in her documentary, Oscar Arias: Without A Shot Fired. The story of Arias’s quest to end military conflict contains a great amount of detail, and intertwines closely with historical events both in Central America and around the globe. The film mainly follows Arias’s efforts to create a Peace Plan to stop the fighting between the Sandinista government and the Contra rebels in Nicaragua during the 1980s. He struggled against the world superpowers who backed the warring factions with military resources- namely, the Soviet Union, who backed the Sandinista government, and the United States, who backed the Contras. But later on, the film also follows Arias’s quest in the 21st century to create a new international treaty for arms control, in order to stop the sales of weapons to developing nations by the world powers. Although the film provided a great deal of historical background, it left me without a true sense that I knew Oscar, the man himself. The film touches briefly on his early life, college years, and young adulthood during the Vietnam War, but these feel like side notes to the discussion of the Peace Plan. Perhaps my expectations were influenced by the title, which bears his name, but I wanted more of a perspective into his personal life, to learn who he was, and really feel his reasons for dedicating his life to peace. Most people can agree that a world without war would be a far better place to live, and it feels good to see filmmakers spreading this message (as Peacejam has with their series of documentaries on Nobel Peace Prize laureates). However, this message alone doesn’t necessarily engage my emotions as a viewer as much as it would if I were tied strongly to the man at the center of it all. By showing more of the intricacies of Oscar’s daily life, incorporating more stories from his close friends and family, and maybe even showing some of his imperfect sides, the filmmakers could have created a portrait of a complex human being. This would serve their story more strongly, because then viewers would truly be able to put themselves in Oscar’s shoes. This could lead to massive inspiration and action from countless people who watch the film. 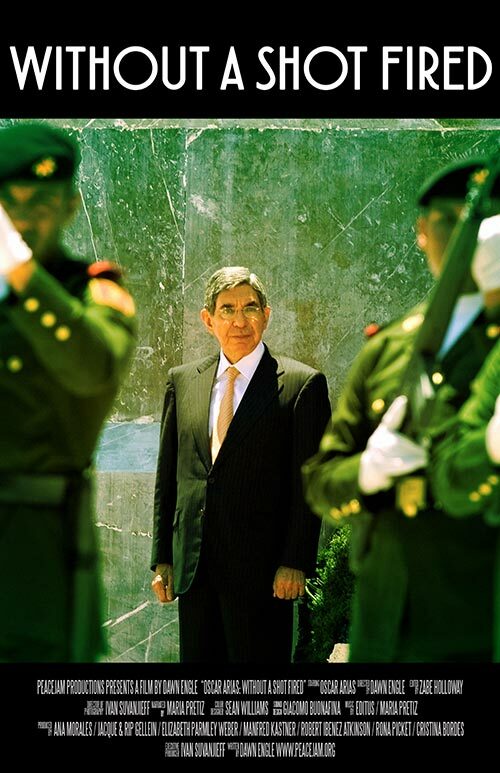 Oscar Arias dedicates his life to ending military conflict in our world. He has often met resistance from powerful world leaders with political interests in military conflicts, as well as those who profit from the sale of weapons. 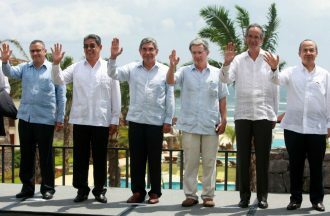 Despite resistance, he managed to collaborate with other Latin American leaders on a Peace Plan to stop much of the violence in their respective countries and the surrounding regions. Oscar’s work towards a peaceful world continues to this day. Overall, the film showcased solid production values. The creators utilized existing news footage and other sources in order to tell a story spanning generations. There were no noticeable gaps in the chronology of the history they laid out for the audience. At times, changes in the voice of the narrator threw me off because I wanted the familiarity of a consistent voice guiding me through. But the variety of narrators still communicated the information well. At times, however, it felt more like a textbook than a film due to the sheer volume of facts, dates, and events covered. This may be expected of a documentary of this type, yet, the lack of access to the inner, emotional journey of Oscar causes the facts presented in the film to hold less interest. It is too bad that Oscar could not be interviewed specifically for this documentary (it appeared that pre-existing footage made up the entirety of the film), because some shots of him in an interview that felt more immediate and present may have added that personal connection. The film spreads a good message, and I wanted to absorb as much of it as possible. However, my interest did wane by the halfway point, due to the lack of insight into Oscar’s individual life. On principle, I never abandon films because I always want to see what the filmmakers will deliver in the end. Though this film was informative and positive, it could have been more engaging. Oscar Arias: Without A Shot Fired provides a wealth of information about Oscar Arias’s work to eliminate armed conflict in our world. At times, the focus on information over personal connection causes the viewer to feel distanced from the material. Yet, hopefully the positivity of this documentary will inspire many to follow Arias’s ideals and help to spread his message of peace. 7.0 – Worth watching at a local film festival or university screening. Manuel Crosby is a filmmaker currently based in Northern California. As a cinematographer and editor, he works with other filmmakers throughout California. Also, as a writer and director he creates many short films available on his Youtube channel and at http://manuelcrosby.com/, including the western "Dead Man's Locket" and the thriller "Precaution". Finally, he is a longtime volunteer at Calaveras County Public Access Television. Manuel is currently working on his feature length co-directing debut: a dark-comedy, coming-of-age thriller called "First Date".